From January 7th to the 27th, our church hosted 21 days of Prayer and Fasting. My friend, Taylor, and I committed to doing a Daniel’s fast for three weeks. Both of us being from the South, our diets are full of butter, cream, milk, fried foods, and savory meats so this fast was definitely challenging for us. But we definitely reaped the benefits of devoting and challenging our bodies and minds to Christ for those 21 days. 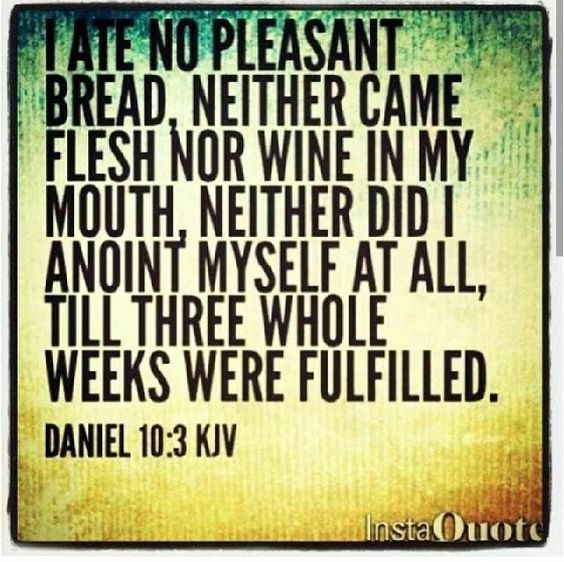 The Daniel’s fast was introduced in the book of Daniel Chapter 1. Daniel (given the Babloynian name… Belteshazzar), Hananiah (Shadrach), Mishael (Meshach), and Azariah (Abednego) are selected into King Nebuchadnezzar’s service to learn the language and the literature of the Babylonians for three years. The king provided each of these young men with daily portions of royal food and wine. The royal food was most likely hooved animals, like horses and pigs, that were deemed unclean by God for the Israelites to eat. 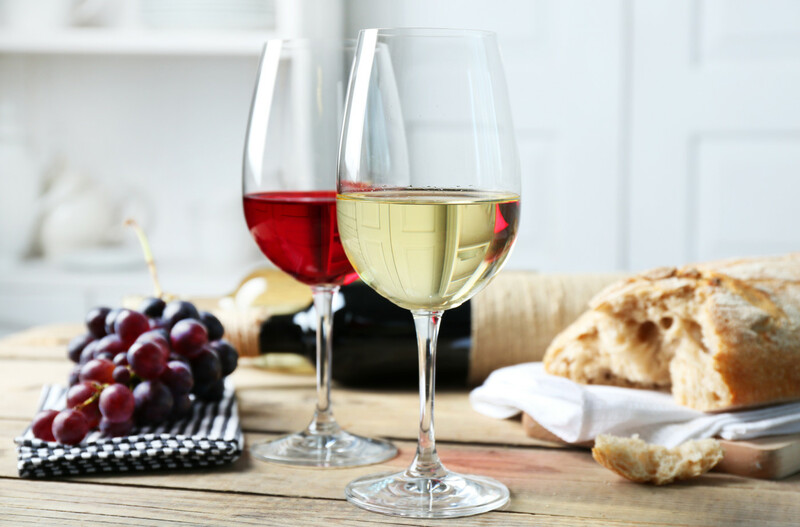 Therefore, Daniel did not want to defile himself by eating these unclean foods and wines. He asked the guard that was appointed to watch over his friends and him if he could not defile himself by eating these royal foods. The guard was concerned that Daniel and his friends would begin to lose weight and look sickly, which would reflect that the guard was not conducting his job very well. 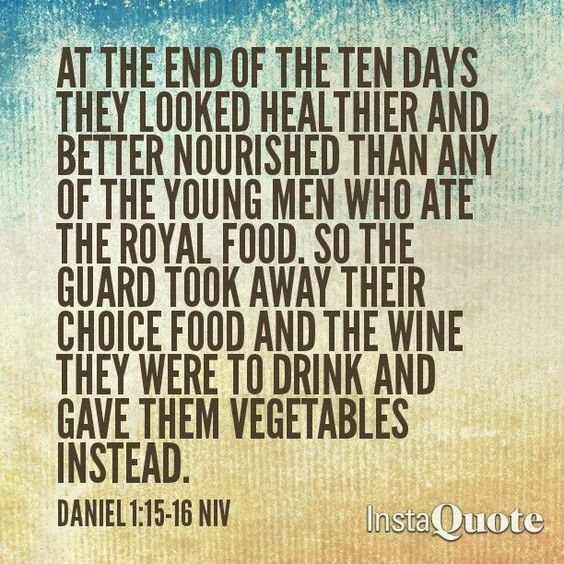 Daniel pleaded with the guard to let Daniel, Hananiah, Mishael, and Azariah only eat vegetables and drink water for 10 days. Then the guard could then compare Daniel and his friends’ physical appearance to the young mens’ who eat the royal foods then decide if they were required to eat the royal foods or not. At the end of the ten days, Daniel and his friends looked even healthier than the young men who ate the unclean foods! Due to their obedience and willingness to follow God’s laws and commandments, God gave these men favor with the Babylonians and also gave them wisdom and understanding of all kinds of learning and literature. Daniel was also given gifts of visions and dreams. Later in Daniel Chapter 10, after the rise of the Persian king, Cyrus, Daniel has a vision from God about a Great War that was to come. During this time, Daniel mourned for three weeks. He ate no choice foods (no meat or wine) and did not wear lotion for three weeks. Although Taylor and I were not technically in mourning, we definitely felt tired and sick for the first days of the fast. Our bodies were detoxing from all the animal products, caffeine, and sugar from our years of eating whatever we wanted all the time. I experienced severe caffeine withdrawals for the first two days and was very tired. But after those first days of going “cold turkey,” my body quickly adapted and adjusted to this new diet. Taylor and I both lost a few pounds, felt lighter, and were more focused during this time. I think one reason why we lost weight was, because we were so conscious of what we were eating all the time. We were not going out to eat at restaurants where they use a pound of butter to cook a hamburger. We were not able to just pick up a snack or lunch at a fast food restaurant or from the convenient store. We prepared most if not all of our own food every day. I was definitely surprised at some of the items in the grocery store that have milk products and eggs in them. You would not expect that almost all of our American food has some animal product in it! I definitely believe that as Americans, we eat way too many animal products every day, which is not necessarily how our bodies were designed. In some countries, meat is a delicacy opposed to a staple in their diet. Going forward, we believe that we can eat less meat than we use to and eat more plant-based meals. Most of the food that we ate was delicious despite not having any animal products in it. At the bottom, I listed my Pinterest Daniel Fast Board which includes amazing vegan dishes to try. I also include some of the recipes with pictures of what we ate. Before the fast, I had a lot of questions about my and my family’s future. I could not see a clear vision of what I wanted to do for a career or what the next couple of years would look like for my family. Christian will be going to training over the summer for four months and will be possibly deployed in 2020. I’m not sure if I want to go back to school to obtain a Ph.D. in clinical psychology or if I wanted to go another route for my career. Over the 21 days of the fast, God was showing me His desires and plans for my life. During this time, I realized my true passion is for the people in society that we overlook or exclude. Jesus also cared about the “out-casts”, like the woman with the issue of blood, the loper, the demon-possessed man, and the blind man. These are all people that during their time were different and on the outskirts of the “norm.” These individuals were cast off and sometimes exiled from Jewish society. My passion is for individuals that we tend to stigmatize and isolate from “our world.” But these people are also part of our world and made in the image of God. I really care for those with mental illnesses, those with special needs, prisoners, children, the elderly, and those that are just a little outside of what society accepts and deems “normal.” I really believe that this is a time in our country where we are more accepting as a group of people. I believe that there is an open discussion about things that were once taboo and stigmatized. There is more of an awareness of these topics in this generation than ever before. I’m not saying we are 100% there, but there definitely has been a social shift during the past few generations. I hope to be part of this change and love people for the way God created them to be. I hope to help reduce prejudice and stigmatization through humanitarian work in our country and others. So I guess… no, I did not receive God showing me an exact plan, but He did not have to. He was showing me the big picture, and I trust that the Spirit will guide me and reveal my future as it comes. I also had some really, really crazy vidid dreams from God too, which also led me to this revelation. Following his fast, Daniel also received the gift of visions and dreams. That’s crazy, right?! Taylor’s experience was a bit more challenging than mine given she works in the food industry at a local seafood restaurant. She was constantly around and serving this delicious, non-vegan food to others. In the whole restaurant, she could only eat green-beans with no butter and white rice. There are not any other vegan options. She believed that God was testing her strength and endurance to maintain this fast. Through this spiritual sacrifice, God revealed to Taylor that there are other people in the world that are not as blessed as she is. A lot of people in the world and our own country cannot afford to go to a local restaurant and order whatever food they want at any time. She also realized there is so much more suffering in the world. There are people who did not have access to food, water, and shelter. After college, she plans to go on mission trips to parts of the world that are stricken with poverty and show the love of God to these people. She also wants to witness to others how much more blessed and peaceful her life has become since she surrendered her life to Christ. I think what Taylor experienced is so powerful. It is true that as a society we are not content with what we have. We want more clothes, cars, a bigger houses, more money, and just more stuff. Taylor was able to take a step back and realize that she is truly blessed. Not only because she lives in America and has enough money, food, water, and shelter, but also because she has Jesus living inside of her. We see the commercials and have the knowledge of this. We know that there are people in poverty and hurting people, but it’s so easy to write this off. 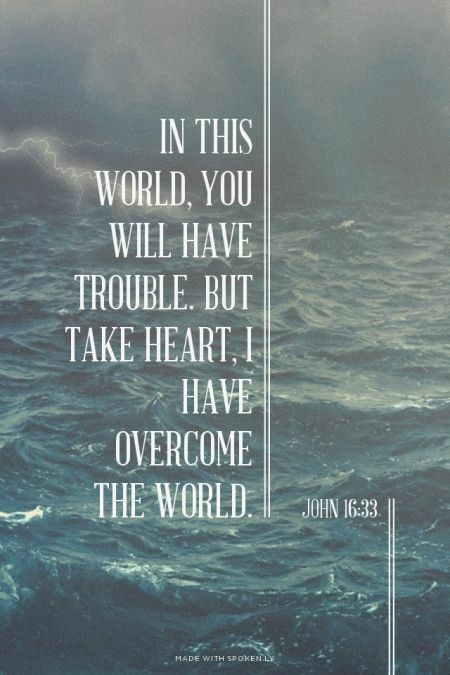 If you can, take a second to pray for those who are suffering and hurting. Maybe try volunteering at a homeless shelter or soup kitchen. Serve at your local church. Donate to a non-profit organization you believe in. Do something to make this world better than it was when you first entered it. I have attached my Pinterest Daniel’s Fast below! 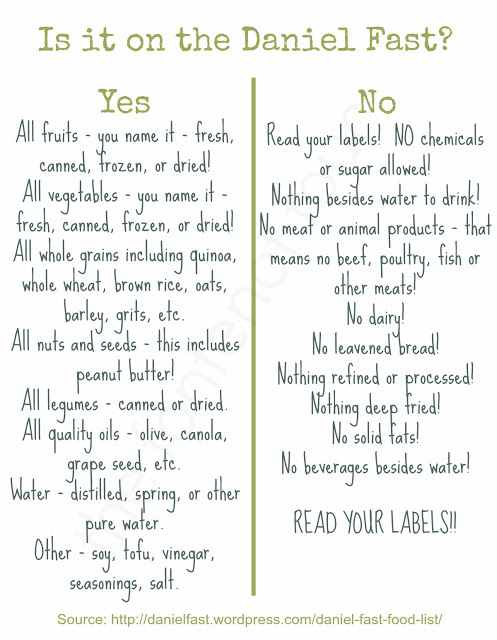 Here are a few of my favorite staples, meals, and substitutes for animal products! Here is my Pinterest board with delicious vegan-friendly recipes!